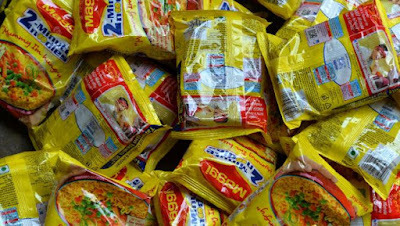 India’s government is preparing to seek damages from Nestle after a food scare involving excessive lead in its hugely popular Maggi noodles sparked a nationwide recall, an official said Monday. The consumer affairs ministry is to seek an undisclosed amount of compensation from the Swiss giant for false advertising after the food safety regulator branded the noodles “unsafe” and “hazardous”. indomie-book-picsMinistry deputy secretary G.C Rout said the case would be filed in the National Consumer Disputes Redressal Commission, a semi-judicial body that can levy fines against companies. “We are going to file a case against Nestle and are presently collecting the material for the case,” Rout told AFP, saying the minimum amount that could be sought was 10 million rupees ($156,000). “There are sections of the consumer protection act that empower state and central governments to file a case in the larger interest of the consumers.” A Nestle spokesman said the company was not willing to comment as it had not yet seen the case. The Food Safety and Standards Authority of India (FSSAI) banned Nestle on Friday from making and selling the noodles after tests by some states found lead levels above statutory limits.